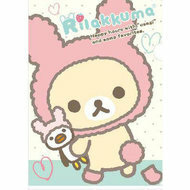 One sheet of poofy and spongy Korilakkuma stickers. Pre-cut and thick self-adhesive stickers. You can use these for a variety of purposes. Just cut, peel and stick!